One of my favorite modes of transportation for photography is cycling. (To be honest, it's my favorite mode for just about everything.) 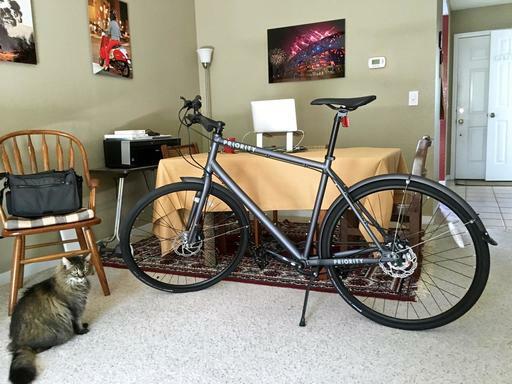 I recently received shipment of the new Priority Eight by Priority Bicycles ($799 online). And if you're considering a new set of wheels, or your first set, read on. Newly assembled Priority Eight bike. It took about 30 minutes to unpack and prepare for riding. Photo by Derrick Story. The seat is well-designed, but it's a bit more racing style than for pure comfort. Depending on your vision for the Priority Eight, you may want a different type with more padding. This is really my only quibble with the bike. And to be honest, it comes down to riding style. I'm sticking with the original for now. We'll see how I feel after a few more rides. 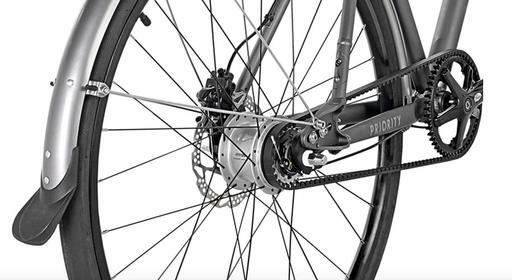 The power train is the excellent Gates Carbon Drive that features a carbon-fiber belt (instead of an oily chain) that meshes with the internally geared rear hub. This is my first belt drive, and I love it! Paired with the Shimano Nexus 8 Twist on the right handle bar grip, I can quickly and quietly shift through all eight gears. The readout on the Twist keeps me informed of which gear I'm currently using. I like wider tires, and Priority knocked it out of the park by choosing Continental Puncture Resistant 700 x 32s. They look great, especially paired with the matching fenders. And for secure stopping, Priority chose Tektro HD-M330 Hydraulic Disc Dual Piston brakes. I like them. The bike arrives securely packed, requiring only a few finishing touches by its new owner. They recommend that you have a professional complete the assembly - not a bad idea if you're new to cycling. But experienced riders won't have a problem getting the Eight prepped for the road. The necessary tools are even included in the box. Nice touch. After about a half an hour of assembly, I spent another hour making minor adjustments during shake down rides. I'm probably more picky than some when it comes to final tweaks. But it's time well spent as far as I'm concerned. After adjusting the seat height, handlebar position, brakes and drive train, the Priority Eight was ready for its first tour. I rode for eight miles (of course!) then returned to the studio, made a few more tweaks, then rode again. Shifting and braking was smooth, my hands felt great, and even the skinny seat was fine. 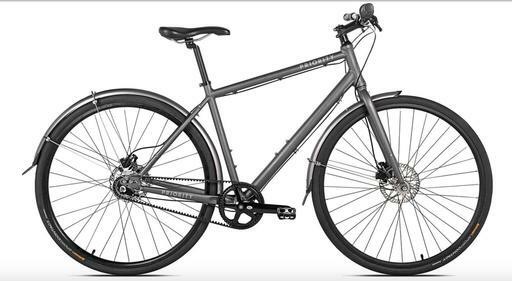 The Ultralite 6061 T6 Aluminum frame is solid and not too heavy (entire bike weighs in at about 26 pounds). I didn't have a problem carrying it up steps or hanging it on its rack. I did notice some chirping on bumpy roads. It didn't bother me, but I'm going to track it down. Not sure if it's the frame or the fenders. But considering that I'm 6'7" and over 200 pounds, performance was excellent. BTW: the Priority Eight is available in 3 sizes. I have the XL model. In terms of acceleration, the Gates Carbon Drive combined with the bike's geometry makes for plenty of getup and go. I didn't feel like I was going that fast, but my route times have been logging in about 10 percent faster than compared to the same rides with my Cannondale Bad Boy, which is no slouch on the road. The Priority Eight is a well-designed urban bike that incorporates quality components with good design. It's particularly well-suited for urban riders and backroad explorers who want a great set of wheels at an affordable price. I'm using it for running errands around town and for local shoots. Plus I like having a bike that doesn't look like all the others chained up outside the store. Santa Rosa is a popular cycling town. People notice it when you have a great-looking set of wheels. The Priority Eight handsomely fits that bill too.